Our week started off by making a little trip to Basel in Switzerland (that's just a 2 hour drive from us in Stuttgart) to not only meet up with close friends, but also see one of them perform as Jesus, in Jesus Christ Super Star the musical. It was a lovely couple of days, getting away from home and having a catch up with our friends. Time full of chit chat and laughter! Today, we are back home in Stuttgart and have enjoyed a quiet day in. It's been very low key, consisting of only leaving the house to take Poppy for a walk. The rest of the day has been spent doing the boring (but essential) jobs like washing and cleaning. Matt is off from work until Saturday and after deciding where to go and what to do with the rest of our week, we've opted for spending a few days at home. We have no obligations to be anywhere or do anything (unless we want to). That feeling of being at home really can feel like such a luxury when you've been on the go for quite some time. Having the day at home creates the perfect opportunity for us to sit down and share with you all. Today we have a rather cute little project to share with you all, inspired by a picture we snapped whilst walking through the forest. This rather lonely mushroom was the inspiration for us to put hook to yarn and come up with a rather cute pattern for some mushrooms and toadstools. Matt got to work making toadstools and Dennis made mushrooms. OOOOOH aren't toadstools and mushrooms rather magical? 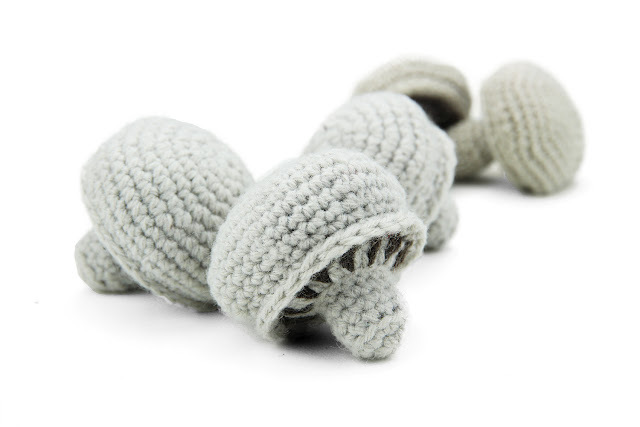 These teeny tiny toadstools were made using "Oslo" by Wolle Rödel. It's a worsted weight yarn, but since we wanted to keep them quite small and firm, we decided to use a 2.5mm crochet hook. Using this rather small hook meant that we ended up with nice tight stitches, perfect for keeping the stuffing from showing through! It's tricky when working on such a small project not to get carried away and make tons of them. It really does feel like the more the merrier! Whilst working on the toadstools and mushrooms, we made sure to jot down the pattern so that you guys would also be able to make a few. We took pictures along the way to make the pattern that much clearer. Before we knew it.....Matt hand made a dozen or so toadstools, complete with twine so they could be used as hanging ornaments. Dennis' mushroom were also not looking too shabby! Aren't they rather charming also? Dennis' mushrooms were made with earthy greys and browns. The yarn he used is: "Rico Baby Classic dk". He also used a 2.5mm hook to get nice tight stitches. Didn't they turn out lovely?! All bundled together like they've been freshly picked from the forest. 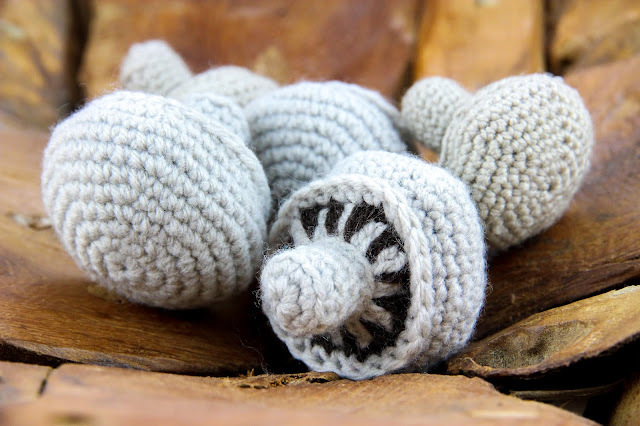 Of course we jotted the pattern down on our pattern page so you could try making some also. Let us know how you get on. 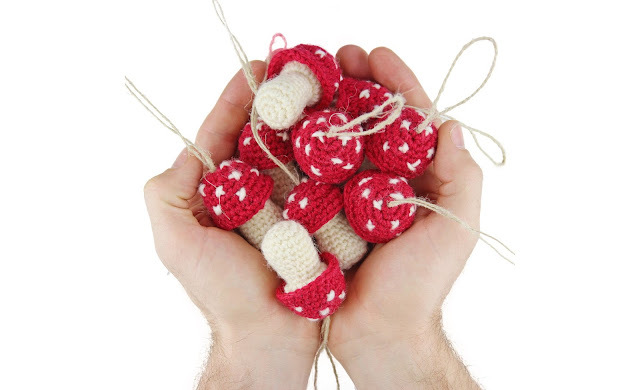 We're thinking the toadstools may be making an appearance next Christmas, as Christmas tree decorations! We hope you have fun making them!!! Click here to go straight to the Pattern page and download your FREE PDF! Hi Dennis and Matt and Poppy! 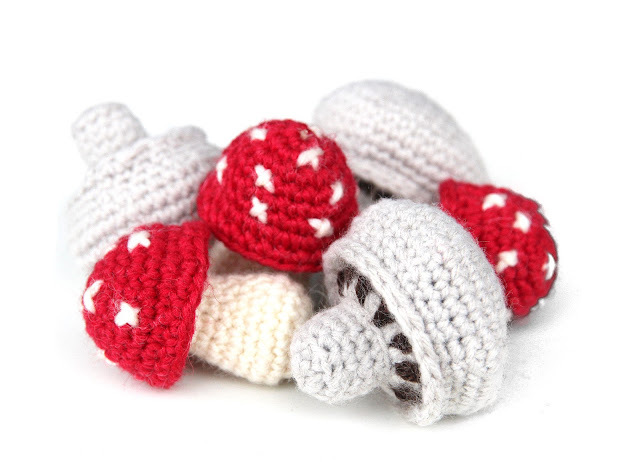 Totally love mushrooms and the ones you both have made are absolutely smashing! 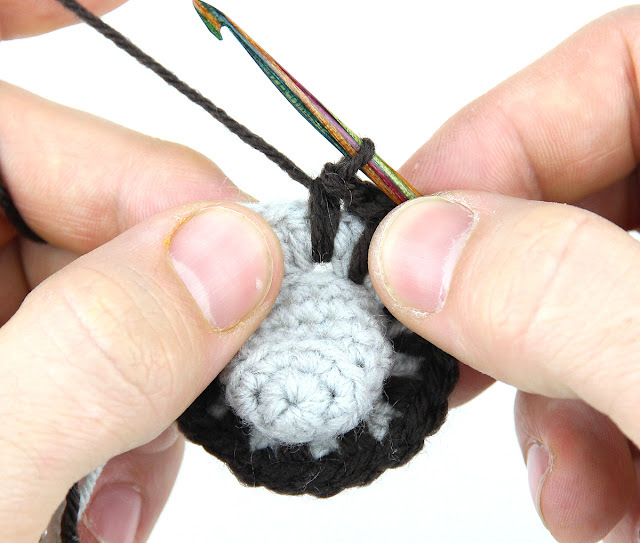 I found Matt's blog initially when I saw his crochet clock on Pinterest....had a terrible attack of the wanties! Have promised to make one for myself....hopefully soon, so many lovelies are on my list! Anyway totally enjoy the new blog, well done and please do loads more patterns and tutorials...hugs to Poppy, she is a cutie! Thank you for the inspiration and have a lovely weekend!